In Ruth Davidson's YES SHE CAN we meet world-beating women from fields as diverse as science, politics, the military, business and sport. They share their own journeys to the top - whether that's becoming Prime Minister, winning an Olympic gold medal or teaching male special forces how to fight. They share the bad times too, the challenges faced and difficulties to hurdle, explaining what they've learned along the way. We also see the author's own path as she tracks the societal shifts that have seen women advance - and discuss how far we've still got to go. 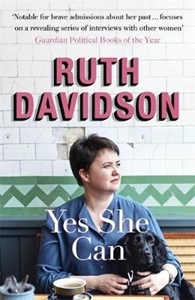 Revealing, inspiring, informing, YES SHE CAN takes personal stories and deftly weaves them into an equalities manifesto for the modern age, a timely rallying call to make the life lessons of this book a reality for generations to come.